Continental is continuing its successful range of ultra high-performance summer tyres with the introduction of the new SportContact 6. The new high-technology tyre from the development department in Hanover is now available in an initial launch range of forty-one dimensions, produced for rims with diameters of between 19 and 23 inches. The SportContact 6 is particularly suited to pure sports cars such as the Audi R8 or Porsche 911 as well as vehicles such as the BMW 5 Series or Mercedes AMG. The range also includes a suitable tyre for the electrically powered Tesla Model S.
Continental expects this ultra high-performance market segment to become increasingly popular with customers and is anticipating annual market growth of just under 10% for the various sizes of the new SportContact 6. The new high-technology tyre has already received its first seal of quality, with Honda approving the tyre for the new Civic Type R before its official release, achieving an impressive lap record on the Nordschleife at the Nürburgring. To boost the performance of the new SportContact 6 even more, the chemists at Continental have further developed the “Black Chili” tread compound. In the new SportContact 6, two factors ensure optimum adhesion when pushed to the limits. The rubber compound is designed to mesh with the roughness of the road. At the same time, temporary atomic connections between the tyre compound and the road surface ensure high adhesion, acting like small suction pads at nanoscopic level. Both factors make for the greatest possible adhesion in all directions – during braking, cornering, and acceleration on both wet and dry roads. To achieve precise handling and rapid steering performance, Continental’s tyre designers use force vectoring technology for optimal force transfer. This technology deploys different tread elements on the inside, outside, and center of the tyre. 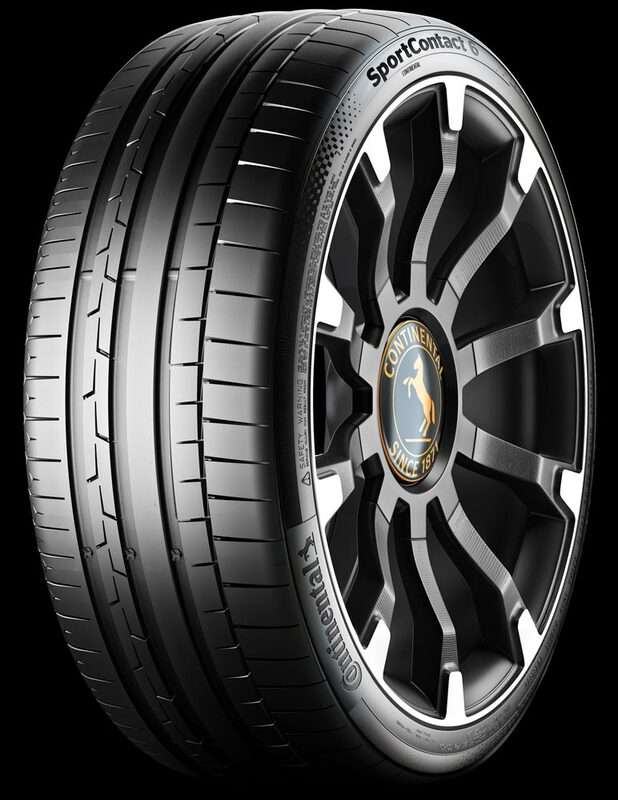 Depending on the size of the tyre, three or four central ribs and the tyre’s inner shoulder ensure a maximum crosswise transfer of force, noticeably improving the direct translation of steering commands to the road. Because the outside of the tyre is subject to greater forces than the inside during cornering, the rib flanks are designed to be asymmetrical. This increases the stability of the ribs and allows greater forces to be transferred. When working on the outer shoulders, the tyre designers combined the different block elements to form one larger unit. Large tread blocks on the outside are connected with interlaced elements in a second row of blocks. This allows the tread blocks to support each other during fast cornering and offer optimum lateral force transfer. Continental’s new SportContact 6 is approved for up to 350 km/h (220 mph), meaning not only does it need to offer perfect braking performance, handling, and directional stability, but its structure must also be adapted to these extreme speeds and the associated enormous centrifugal forces on the tyre. To achieve this, Continental’s engineers have come up with an innovative structure that controls the huge forces on the tyre, ensuring maximum driving safety. Using the innovative “Aralon 350” material developed especially for the SportContact 6, Continental utilises a synthetic fiber in which two yarns made from strong aramid are closely interwoven with a yarn of flexible nylon. Implanted in rubber, this fiber is placed under the tread as a jointless cap ply. This complex structure acts like an additional steel belt and offers controlled, safe tyre contour behavior even at maximum speed. The first high-performance “ContiSportContact” tyre was released for sale in 1994. As was usual at the time, it emerged from the hot press in sizes of between 13 and 20 inches. It was soon a firm favourite with tuners and vehicle manufacturers alike. Manufacturers such as Audi, Porsche, BMW, Mercedes, ABT, and Hartge all used the sports tyre in their top models. But the tyres were also a hit with end consumers. It was therefore seven years before a successor – the ContiSportContact 2 – was required. Today, the tyre industry expects shorter product cycles because progress made in R&D is quickly passed on to motorists through new developments. All “ContiSportContact” tyres have proven successful: In addition to a number of test successes in the trade press, Continental’s first-class products have racked up over 250 approvals from vehicle manufacturers and tuning specialists. While the European tyre market is relatively stable, the high-performance segment can expect its “UHP” products to present good opportunities for growth. Continental forecasts suggest that tyres in the now sought-after sizes for rims of between 17 and 18 inches will rise by around 5% each year until 2020, and the tyre manufacturer expects this segment to reach a volume of around 37.3 million by 2020. Demand for tyres with diameters of between 19 and 23 inches is expected to increase even more: An average of 9% is expected each year, equating to 7.5 million tyres by 2020. A closer look at the forecasts shows that the larger the tyre, the greater the growth. The expectation is for 19-inch to increase by 8%, 20-inch tyres by 10%, while experts assume that tyres with diameters of 21 inches or more will rise by 14% each year. This means that demand in this segment would almost double by 2020. Continental expects the new SportContact 6 to achieve good approval levels not just from motorists, but also from vehicle manufacturers. At the moment, around one third of new vehicles from European car manufacturers roll off the production line with Continental tyres. Original equipment customers expect a lot – particularly in the EU and Continental are encouraged by initial approval received even before the market launch.